The Burroughs Corporation was a major American manufacturer of business equipment. The company was founded in 1886 as the American Arithmometer Company, and after the 1986 merger with Sperry UNIVAC was renamed Unisys. The company's history paralleled many of the major developments in computing. At its start, it produced mechanical adding machines, and later moved into programmable ledgers and then computers. It was one of the largest producers of mainframe computers in the world, also producing related equipment including typewriters and printers. In 1886, the American Arithmometer Company was established in St. Louis, Missouri to produce and sell an adding machine invented by William Seward Burroughs (grandfather of Beat Generation author William S. Burroughs). 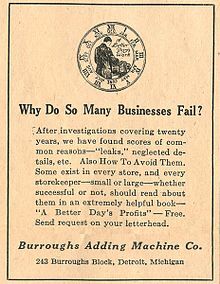 In 1904, six years after Burroughs' death, the company moved to Detroit and changed its name to the Burroughs Adding Machine Company. It was soon the biggest adding machine company in America. The adding machine range began with the basic, hand-cranked P100 which was only capable of adding. The design included some revolutionary features, foremost of which was the dashpot. The P200 offered a subtraction capability and the P300 provided a means of keeping 2 separate totals. The P400 provided a moveable carriage, and the P600 and top-of-the-range P612 offered some limited programmability based upon the position of the carriage. The range was further extended by the inclusion of the "J" series which provided a single finger calculation facility, and the "c" series of both manual and electrical assisted comptometers. In the late 1960s, the Burroughs sponsored "nixi-tube" provided an electronic display calculator. Burroughs developed a range of adding machines with different capabilities, gradually increasing in their capabilities. A revolutionary adding machine was the Sensimatic, which was able to perform many business functions semi-automatically. It had a moving programmable carriage to maintain ledgers. It could store 9, 18 or 27 balances during the ledger posting operations and worked with a mechanical adder named a Crossfooter. The Sensimatic developed into the Sensitronic which could store balances on a magnetic stripe which was part of the ledger card. This balance was read into the accumulator when the card was inserted into the carriage. The Sensitronic was followed by the E1000, E2000, E3000, E4000, E6000 and the E8000, which were computer systems supporting card reader/punches and a line printer. Later, Burroughs was selling more than adding machines, including typewriters. But the biggest shift in company history came in 1953: the Burroughs Adding Machine Company was renamed the Burroughs Corporation and began moving into computer products, initially for banking institutions. This move began with Burroughs' purchase in June 1956, of the ElectroData Corporation in Pasadena, California, a spinoff of the Consolidated Engineering Corporation which had designed test instruments and had a cooperative relationship with Caltech in Pasadena. ElectroData had built the Datatron 205 and was working on the Datatron 220. The first major computer product that came from this marriage was the B205 tube computer. In the late 1960s the L and TC series range was produced (e.g. the TC500—Terminal Computer 500) which had a golf ball printer and in the beginning a 1K (64 bit) disk memory. These were popular as branch terminals to the B5500/6500/6700 systems, and sold well in the banking sector, where they were often connected to non-Burroughs mainframes. In conjunction with these products, Burroughs also manufactured an extensive range of cheque processing equipment, normally attached as terminals to a larger system such as a B2700 or B1700. Burroughs was one of the nine major United States computer companies in the 1960s, with IBM the largest, Honeywell, NCR Corporation, Control Data Corporation (CDC), General Electric (GE), Digital Equipment Corporation (DEC), RCA and Sperry Rand (UNIVAC line). In terms of sales, Burroughs was always a distant second to IBM. In fact, IBM's market share was so much larger than all of the others that this group was often referred to as "IBM and the Seven Dwarfs." By 1972 when GE and RCA were no longer in the mainframe business, the remaining five companies behind IBM became known as the BUNCH, an acronym based on their initials. At the same time, Burroughs was very much a competitor. Like IBM, Burroughs tried to supply a complete line of products for its customers, including Burroughs-designed printers, disk drives, tape drives, computer printing paper, and even typewriter ribbons. In the 1950s, Burroughs worked with the Federal Reserve Bank on the development and computer processing of magnetic ink character recognition (MICR) especially for the processing of bank cheques. Burroughs made special MICR/OCR sorter/readers which attached to their medium systems line of computers (2700/3700/4700) and this entrenched the company in the computer side of the banking industry. The Burroughs large systems machines started with the B5000 in 1961. The B5500 came a few years later when large rotating disks replaced drums as the main external memory media. These B5000 Series systems used the world's first virtual memory multi-programming operating system. They were followed by the B6500/B6700 in the later 1960s, the B7700 in the mid 1970s, and the A series in the 1980s. The underlying architecture of these machines is similar and continues today as the Unisys ClearPath MCP line of computers: stack machines designed to be programmed in an extended Algol 60. Their operating systems, called MCP (Master Control Program—the name later borrowed by the screenwriters for Tron), were programmed in ESPOL (Executive Systems Programming Oriented Language, a minor extension of ALGOL), and later in NEWP (with further extensions to ALGOL) almost a decade before Unix. The command interface developed into a compiled structured language with declarations, statements and procedures called WFL (Work Flow Language). Many computer scientists consider these series of computers to be technologically groundbreaking. Stack oriented processors, with 48 bit word length where each word was defined as data or program contributed significantly to a secure operating environment, long before spyware and viruses affected computing. And the modularity of these large systems was also unique: multiple CPUs, multiple memory modules and multiple I/O and Data Comm processors permitted incremental and cost effective growth of system performance and reliability. In industries like banking, where continuous operations was mandatory, Burroughs large systems penetrated most every large bank, including the Federal Reserve Bank. And Burroughs built the backbone switching systems for Society for Worldwide Interbank Financial Telecommunication (SWIFT) which sent its first message in 1977. Unisys is still the provider to SWIFT today. Burroughs produced the B2500 or "medium systems" computers aimed primarily at the business world. The machines were designed to execute COBOL efficiently. This included a BCD (Binary Coded Decimal) based arithmetic unit, storing and addressing the main memory using base 10 numbering instead of binary. The designation for these systems was Burroughs B2500 through B49xx, followed by Unisys V-Series V340 through V560. In 1982, Burroughs began producing personal computers, the B20 and B25 lines with the Intel 8086/8088 family of 16-bit chips as the processor. These ran the BTOS operating system, which Burroughs licensed from Convergent Technologies. These machines implemented an early Local Area Network to share a hard disk between workgroup users. These microcomputers were later manufactured in Kunming, China for use in China under agreement with Burroughs. Burroughs collaborated with University of Illinois on a multiprocessor architecture developing the ILLIAC IV computer in the early 1960s. The ILLIAC had up to 128 parallel processors while the B6700 & B7700 only accommodated a total of 7 CPUs and/or IO units (the 8th unit was the memory tester). Burroughs made military computers, such as the D825 (the "D" prefix signifying it was for defense industrial use), in its Great Valley Laboratory in Paoli, Pennsylvania. The D825 was, according to some scholars, the first true multiprocessor computer. Paoli was also home to the Defense and Space Group Marketing Division. In 1964 Burroughs had also completed the D830 which was another variation of the D825 designed specifically for real-time applications, such as airline reservations. Burroughs designated it the B8300 after Trans World Airlines (TWA) ordered one in September 1965. A system with three instruction processors was installed at TWA's reservations center in Rockleigh, New Jersey in 1968. The system, which was called George, with an application programmed in JOVIAL, was intended to support some 4000 terminals, but the system experienced repeated crashes due to a filing system disk allocation error when operating under a large load. A fourth processor was added but did nothing to resolve the problem. The problem was resolved in late 1970 and the system became stable. Unfortunately, the decision to cancel the project was being made at the very time that the problem was resolved. TWA cancelled the project and acquired one IBM System/360 Model 75, two IBM System/360 model 65s, and IBM's PARS software for its reservations system. TWA sued Burroughs for non-fulfillment of the contract, but Burroughs counter-sued, stating that the basic system did work and that the problems were in TWA's applications software. The two companies reached an out-of-court settlement. Burroughs developed a half-size version of the D825 called the D82, cutting the word size from 48 to 24 bits and simplifying the computer's instruction set. The D82 could have up to 32,768 words of core memory and continued the use of separate instruction and i/o processors. Burroughs sold a D82 to Air Canada to handle reservations for trips originating in Montreal and Quebec. This design was further refined and made much more compact as the D84 machine which was completed in 1965. A D84 processor/memory unit with 4096 words of memory occupied just 1.4 cubic feet. This system was used successfully in two military projects: field test systems used to check the electronics of the Air Force General Dynamics F-111 Aardvark fighter plane and systems used to control the countdown and launch of the Army's Pershing 1 Pershing 1a missile systems. In September 1986, Burroughs Corporation merged with Sperry Corporation to form Unisys. For a time, the combined company retained the Burroughs processors as the A- and V-systems lines. However, as the market for large systems shifted from proprietary architectures to common servers, the company eventually dropped the V-Series line, although customers continued to use V-series systems as of 2010[update]. As of 2017[update] Unisys continues to develop and market the A-Series, now known as ClearPath. In 2010, UNISYS sold off its Payment Systems Division to Marlin Equity Partners, a California-based private investment firm, which incorporated it as Burroughs Payment Systems based in Plymouth, Michigan. Burroughs B205 hardware has appeared as props in many Hollywood television and film productions from the late 1950s. For example, a B205 console was often shown in the television series Batman as the Bat Computer; also as the computer in Lost in Space. B205 tape drives were often seen in series such as The Time Tunnel and Voyage to the Bottom of the Sea. Craig Ferguson, American talk show host, comedian and actor was a Burroughs apprentice in Cumbernauld, Scotland. ^ Dvorak, John C. (2006-11-25). "IBM and the Seven Dwarfs — Dwarf One: Burroughs". Dvorak Uncensored. Retrieved 2010-02-04. ^ Anderson, J. P.; Hoffman, S. A.; Shifman, J.; Williams, R. J. (1962). "D825 - a multiple-computer system for command & control". Proceedings of the December 4-6, 1962, fall joint computer conference on - AFIPS '62 (Fall). p. 86. doi:10.1145/1461518.1461527. ^ Enslow, Philip H., Jr. (1977). "Multiprocessor Organization—A Survey". Computing Surveys. 9 (1): 103–129. doi:10.1145/356683.356688. ^ a b Gray, George (October 1999). "Burroughs Third-Generation Computers". Unisys History Newsletter. 3 (5). Archived from the original on October 2, 2017. ^ "Unisys Awarded Contract to Support IRS Mission-Critical Computing Systems". Unisys. 2013-02-19. Retrieved 2013-03-11. BLUE BELL, Pa., February 19, 2013 - Unisys Corporation (NYSE: UIS) announced today that it has been awarded the Enterprise Computing Center Support (ECCS) contract from the Internal Revenue Service (IRS) [...] Under this single-award indefinite delivery-indefinite quantity (IDIQ) contract, the IRS can award Unisys task orders to provide support and maintenance services for the IRS computing environment, including Unisys ClearPath Dorado servers. ^ "Marlin Equity Partners acquires elements of Unisys payment systems" Archived 2010-04-14 at the Wayback Machine, Burroughs press release, February 3, 2010. ^ Burroughs Payment Systems website.In 2012, the company changed its name to Burroughs, Inc.
^ "Starring the Computer: Burroughs B205"
Gray, George (March 1999). "Some Burroughs Transistor Computers". Unisys History Newsletter. 3 (1). Archived from the original on October 1, 2016. Gray, George (October 1999). "Burroughs Third-Generation Computers". Unisys History Newsletter. 3 (5). Archived from the original on September 26, 2017. Hauck, E.A., Dent, Ben A. "Burroughs B6500/B7500 Stack Mechanism", SJCC (1968) pp. 245–251. McKeeman, William M. "Language Directed Computer Design", FJCC (1967) pp. 413–417. Wilner, Wayne T. "Design of the B1700", FJCC pp. 489–497 (1972). Wikimedia Commons has media related to Burroughs Corporation. "Burroughs B 5000 Conference, OH 98", Oral history on 6 September 1985, Marina del Ray, California. Charles Babbage Institute, University of Minnesota, Minneapolis. The Burroughs 5000 computer series is discussed by individuals responsible for its development and marketing from 1957 through the 1960s in a 1985 conference sponsored by AFIPS and Burroughs Corporation. Oral history interview with Isaac Levin Auerbach Charles Babbage Institute University of Minnesota. Auerbach discusses his work at Burroughs 1949–1957 managing development for the SAGE project, BEAM I computer, the Intercontinental Ballistic Missile System, a magnetic core encryption communications system, and Atlas missile. Oral history interview with Robert V. D. Campbell. Discusses his work at Burroughs (1949–1966) as director of research and in program planning. Oral history interview with Alfred Doughty Cavanaugh Cavanaugh discusses the work of his grandfather, A. J. Doughty, with William Seward Burroughs and the Burroughs Adding Machine Company. Oral history interview with Carel Sellenraad Charles Babbage Institute University of Minnesota. Sellenraad describes his long association with Burroughs Adding Machine Company, and the impact of World Wars I & II on the sales and service of calculators, and adding and bookkeeping machines in Europe. Oral history interview with Ovid M. Smith Charles Babbage Institute University of Minnesota. Smith reviews his 46½ year career at Burroughs Adding Machine Company (later Burroughs Corporation). "Early Burroughs Machines", University of Virginia's Computer Museum.